In our house storytime is one of the most favorite times of the day. We snuggle up in bed and read a story to end off the day. One of my favorite toy brands, HABA, sent us one of their Lilliputiens toys to review and she’s the perfect doll for storytime! Snow White and the Seven Dwarfs is one of my favorite classic fairy tales and for some reason none of our fairy tale books have this classic in them. 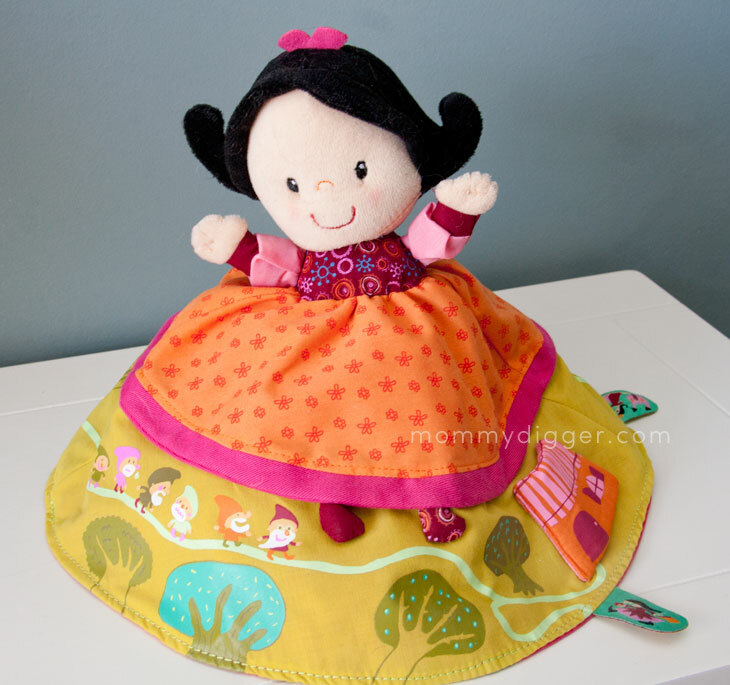 So, now instead I tell them the story in an even more fun way with the Lilliputiens Reversible Snow White Story Doll. Snow White is so sweet – she has rosy cheeks and the jet black hair. Her dress is so cute and has all the details to tell her story, the dwarfs, the woods and the little house in the woods. When you reverse her she becomes the Wicked Witch complete with the wart on her nose and all. The cauldron is on her dress and the poisoned apple is ready to give to Snow White in her pocket. She’s become a storytime favorite and I love reenacting the classic tale for them with her! She’s so well made (she’s handmade!) and the attention to detail is perfect! I received one or more of the products or services mentioned in the hope that I would mention it on my blog. All thoughts and opinions are 100% my own. That’s wonderful your old grandson is enjoying reading! I’m really hoping it helps my daughters to enjoy reading as they get older as well! I had a reversible doll when I was little that I got at a garage sale I believe. She was little red riding hood and the wolf too! I love this doll! These are so neat! Really interesting that they have two dolls in one and it makes great for stories! Thank you so much for sharing this cute little doll. What an adorable doll, perfect for any little girl.